Use an unglazed clay pot,or at least insure the lid's unglazed. Toss long-cooking rice w/vegies & aromatics. Season, place pats of butter over breast & under skin, stuff w/onion & tie legs. Always put clay pot in cold oven, THEN pre-heat. Nothing goes to waste; entrails for the dogs. My friend serving sautéed livers & gizzards to his dogs. The leftovers make awesome chicken & rice soup. After his divorce, he was awarded full custody of the clay pot. “It was perfect for a single man as I could eat from the pot for days and there was only one dish to clean. 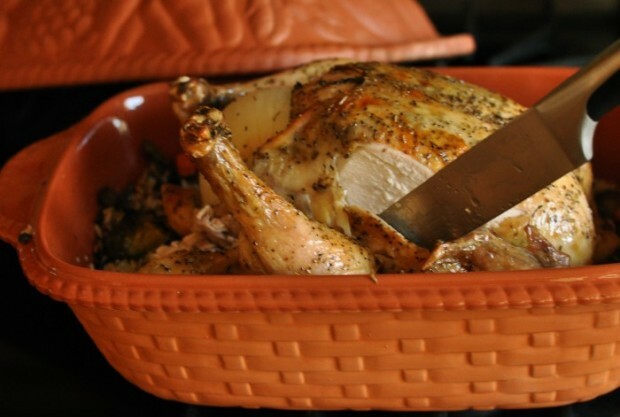 Roasting chickens is my favorite way to use the pot and my recipe is loosey-goosey, varying according to leftovers.” In the same spirit, I used the leftovers I had on hand substituting brussels sprouts, for example, for the cherry tomatoes he used and a rosemary rub for his Cajun blend. Since JC met my friend Kathy, he’s relinquished his single man status and cooks his specialty for her on a regular basis. Last week, I visited them in Colorado so, by default, was included on his guest list. While the pot soaked, I watched him prepare the chicken and studied the book he provided me: “The Complete Guide to Claypot Cooking (Bridget Jones, Salamander Books, London). According to the book, “…Claypot cookery is, in essence, a means of creating full-flavored dishes with the minimum of effort…Using terra cotta pots that have been soaked in water prior to cooking, is one of the oldest traditions and dates back to Roman times…The soaked pots absorb water which generates moisture during cooking creating a unique cooking environment.” This seals in flavor and keeps food from drying out, so their is no need to add extra fat. I couldn’t wait to try the recipe in my own kitchen. JC used an all-clay unglazed Romertopf roaster. According to Saveur. 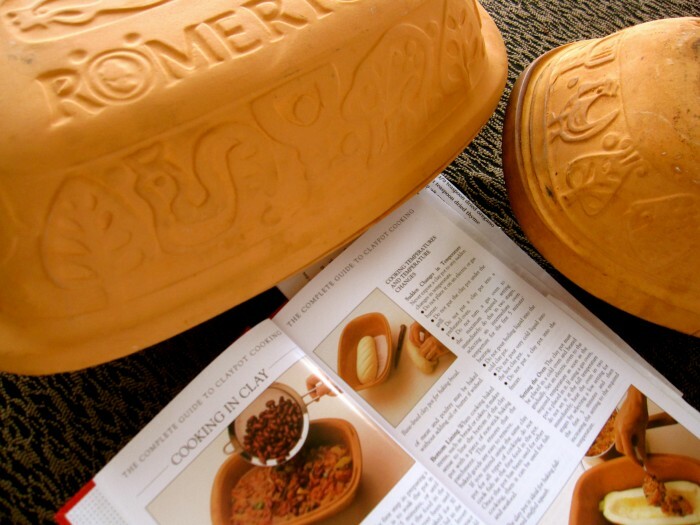 com, the Romertopf was invented by a German and is modeled on an ancient Etruscan design. Today, they are produced in Mexico with the same mixture of clays as the originals. 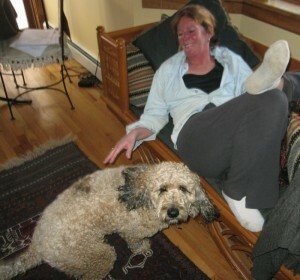 Kathy waits for dinner, Tully waits for scraps. I couldn’t find an unglazed clay pot at local stores but was delighted to find a 4 1/2 quart clay roaster at Downtown Home and Garden, with a glazed bottom and unglazed lid. The moisture absorbed in the large domed lid distributed moist heat producing a tender, evenly cooked, golden bird. The aesthetics of cooking in a natural, earthen element are pleasing; a beautiful oven-to-table serving dish. Delighted with my new toy, I purchased Paula Wolfert’s Mediterranean Clay Pot Cookbook. Wolfert – dubbed the Queen of Mediterranean cooking by the Los Angeles Times – describes herself a “clay pot junkie” and her recipes look absurdly good. “I like cooking with a clay pot much better than a slow cooker,” JC said, as we savored his simple feast. “Vegetables don’t turn to mush nor do they loose nutrition in liquid, and the rice has this incredible flavor and texture.” I remarked that the rice was, indeed, incredible from the chicken fat it absorbed. “And your problem is…?” he responded. Soak unglazed clay according to manufacturers directions, apx. 15 minutes. Combine rice, liquid, mushrooms, carrots, and brussels sprouts at bottom of pot. Combine rosemary, salt and 1 teaspoon of pepper (adding additional pepper to taste) and rub inside chicken cavity. Lift up chicken skin and rub under skin, then over the exterior skin. Stick pieces of butter under skin over breast. Place chicken over rice mixture. Place bay leaf in back of cavity and stuff with onion; tie chicken legs together with string or kitchen twine. **Onion will remain firm through cooking. Feel free to cut into pieces and stir into rice prior to cooking, or omit altogether. A friend reminded that in the 1970s ? that people got lead poisoning from clay ? drinking pitchers they bought in Mexico. Are there any risks of lead or other substances leeching into the food from these clay pot cookers? Thank you! The Romertopf cookers, orignating for this incarnation, are now again reclaimed for manufacture to Germany. I remember tge stories about inexpensive Mexican cooking clay. I wouldn’t eorry about that from a product made by in Germany. OR call romertopfs customer service number. Romertopf is always lead free. Even the one’s made in MX. The company makes strong quality control. The dangerous stuff was the thinner, hand painted stuff made in MX for export, circa 1950’s – 60’s! I just found your blog with great delight. I don’t have a clay pot. Can I use a dutch oven instead? If so, would it cook at the same temperature and length of time? No… you’ll butn it up. Thepotous clay absorbs water, the reason for the pre soak. Then put into a COLD oven and cook at the very high temp. Never, at these temps. You defeat the purpose of the soaked clay. I loved for this good food dish. Flavor for my is a tastes better than desire. Vegetable make good part for chicken also with the chest nut. One time with the heavy doublet creams, the smell from rear bum make the wretched smell. You know what mean yes?